SUDDEN RISE—co-written by Wu Tsang, boychild, and Fred Moten—is the New York City performance debut of the ensemble Moved by the Motion. This “collage” of text, film, movement, and sound is complemented by the words of Langston Hughes, James Baldwin, Hannah Arendt, W.E.B. Du Bois and Jimi Hendrix. Friday, April 26, at 8 pm. Saturday April 27, at 4 pm and 8 pm. Moved by the Motion, Sudden Rise, photographs by Paula Court/EMPAC. Images courtesy of Moved by the Motion and the photographer. This entry was posted in ART, DANCE, FILM, LITERATURE/POETRY, MUSIC, PERFORMANCE, THEATER and tagged Asma Maroof, boychild, Fred Moten, Hannah Arendt, James Baldwin, Jimi Hendrix, Josh Johnson, Langston Hughes, Moved by the Motion, Patrick Belaga, Sudden Rise—Moved by the Motion, W.E.B. Du Bois, Whitney Museum of American Art, Wu Tsang on April 24th, 2019 by Barlo Perry. W.E.B. 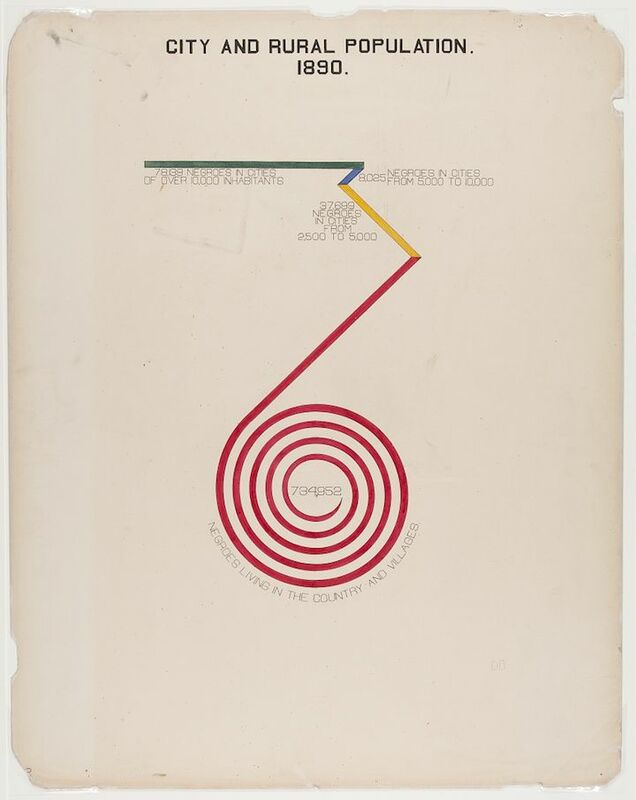 Du Bois—author, sociologist, civil rights advocate, co-founder of the NAACP—was also a pioneer of data visualization. “Working with ink, gouache, graphite, and photographic prints, Du Bois and his student and alumni collaborators at Atlanta University generated crisp, dynamic, and modern graphics as a form of infographic activism. Sixty-three brightly colored broadsheets were exhibited in Paris and made twenty years before the founding of the Bauhaus. Join Poly-Mode partner Silas Munro for a conversation about this work. SILAS MUNRO—W.E.B. DU BOIS’ DATA PORTRAITS: VISUALIZING BLACK AMERICA, Friday, June 8, at 8 pm. LOS ANGELES CONTEMPORARY ARCHIVE, 709 North Hill Street, Suite 104-108 (upstairs), downtown Los Angeles. W.E.B. Du Bois, City and Rural Population. This entry was posted in ART, CONVERSATION, EDUCATION/ACTIVISM and tagged LACA, Los Angeles Contemporary Archive LACA, Silas Munro, W.E.B. Du Bois on June 7th, 2018 by Barlo Perry.